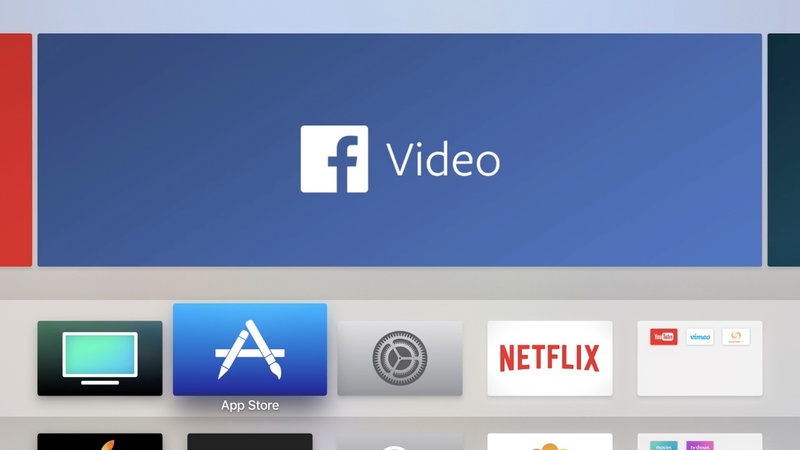 Last night Facebook launched its first app for the Apple TV. Its technical name is simply 'Facebook,' since it's bundled with the Facebook iOS app, but marketing images dub it Facebook Video. 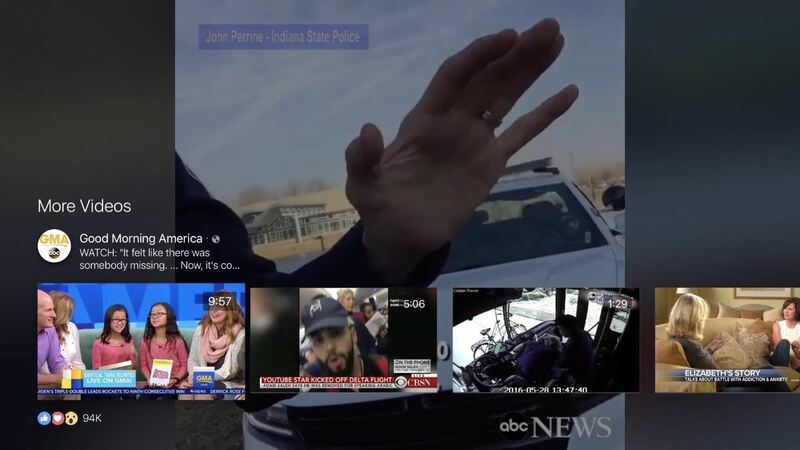 The app provides the first native way to watch video content from Facebook on an Apple TV. Launching the app for the first time will prompt a login. There are two options for logging in. The more convenient option is to open the Facebook app on your phone, go to your notifications tab, and follow the prompts of the newly sent notification. It's quick, easy, and requires no typing of usernames or passwords. Alternately, you can visit facebook.com/device and enter a unique code in there. Once logged in, you'll land on the Home tab of the app. This is where nearly all videos will be found. Videos are organized in horizontal columns by a variety of different categories: Shared by Friends, Following, Recommended for You, Top Live Videos, Saved Videos, and Recently Watched. The main interface of the Home tab. 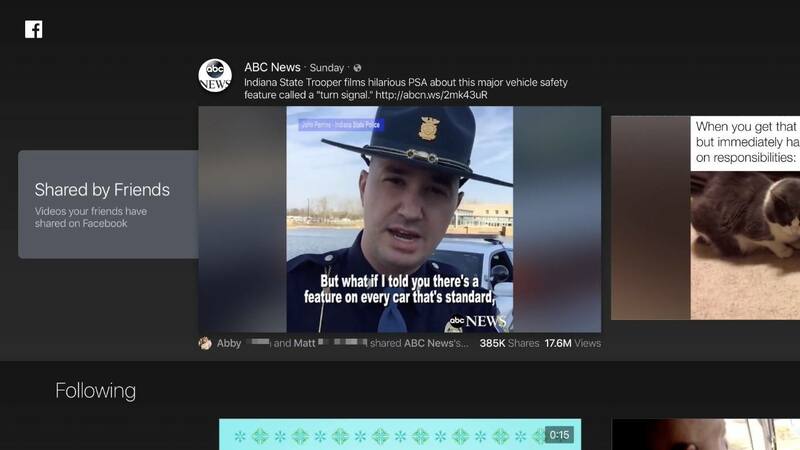 Whenever a video is your highlighted selection, it will auto-play. Unfortunately, I've found no setting within the app to turn off auto-play. Tapping on a video will open it in full screen. Once a video finishes playing, you'll see a countdown that indicates when the next video will begin. The next video that plays will be the one immediately to the right of the one just completed according to your current column. Additional options when swiping down on the Siri Remote. The app has a couple of nice features that can be used during playback. 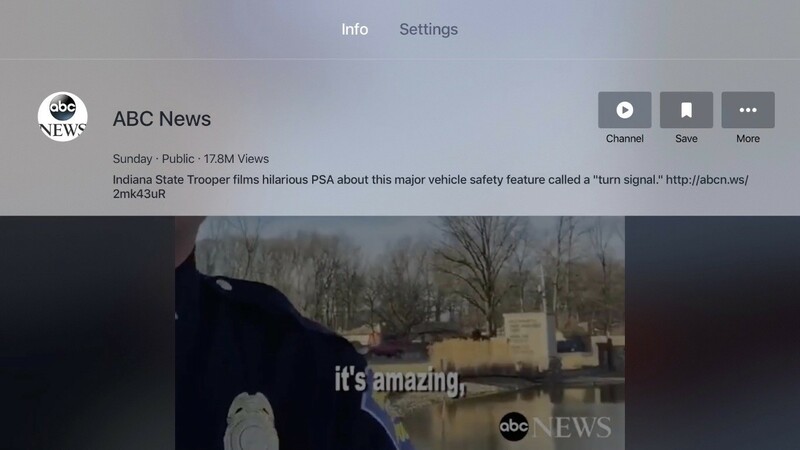 A swipe up on the Siri Remote reveals an assortment of related videos that you can swipe through as your current video is playing. Swiping down on the Siri Remote presents a drop-down pane with two tabs: Info and Settings. Info contains the option to visit the channel that video is from, save the video to watch later, and also hide or report the video in question. The Settings tab presents options to show or hide captions, comments, and/or reactions in the video. Additional videos can be accessed with a swipe up on the Siri Remote. Besides Home, there are two other main navigation tabs: Profile and Settings. Neither of them contains too much. Profile simply shows videos you've shared in the past, and possibly videos you're tagged in, but I wouldn't know as I'm not very active on Facebook. Settings doesn't contain any actual settings at this point, and is virtually useless. One surprising feature that's absent from the app is search. There is no search option anywhere to be found. Perhaps Facebook assumes that if a video isn't in one of Home's categories already, it likely won't be of interest to you. Whatever the reason, I hope a future update remedies this issue. Overall, Facebook's video app is extremely simple, but it seems to work well aside from the unfortunate lack of a search option. For anyone who has longed for a convenient way to watch Facebook videos on the big screen, this new app is a solid solution. I know for me personally, I'll now be more likely to save videos on Facebook for viewing later. I would always forget I had done that when using the iOS app, but the ability to easily watch videos on the big screen should change that.